Is the Right Person Doing the Right Job? Are you worried about your candidate sourcing dilemma? Did you know you have a candidate sourcing dilemma? Because almost everyone does and many executives don’t realize the impact. Recruiting physicians is akin to recruiting executive leadership. They have extensive education, highly defined specialties and they make life and death decisions. Physicians also live in a 100% employed market. If they want a job, they have one. Filling an opening creates another. Stands to reason then that the person who recruits these physicians must be professional, highly trained and personable. Physician recruiters are smart, competent, multi-tasking ninjas with extensive market knowledge, skills and a relationship mentality. Relationship job – relationship personality. So, where is this dilemma? Here it is: identifying candidates, sourcing and screening them is repetitive, data driven and time consuming. Sourcing candidates is the “heavy lifting” piece of the recruiting timeline. Great sourcers thrive on data, live for the search, celebrate the win and go to the next candidate. A transactional relationship and a transactional person. Both sourcing and recruiting are critical. No pipeline no hires. But obviously very different roles, salaries and skills. Keep the right person doing the right job. Engage The Inline Group – we’re the Nation’s only firm dedicated to sourcing primary care candidates. We find them, screen them and present them directly into your candidate pipeline. It’s all we do – our team is those dedicated, driven data lovers who hate to let a good search go unfilled. Sourcing dilemma solved, get a pipeline from TIG and let your professional in-house recruiter drive the deal home. The right person, doing the right job = a better bottom-line. 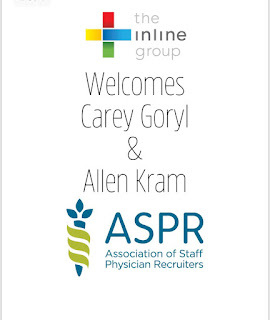 How Did “You” Get Selected as a Strategic Partner with the ASPR? This is the question that I got from a retained recruiter at the ASPR Conference in Chicago. The next question was what percentage cut did they take? She seemed quite taken back. First – my jaw dropped as this particular behemoth company in the industry has never spoken to me, looked at me or waved across the room in 17 years in the industry and countless conferences. My response, “We honestly answered questions about our technology, our processes, our future and the value of our product for their members. And we gave up nothing”. This was an extensive vetting process and required Board approval. The ASPR was clear in their goals, partners who would offer their members a new choice in technologically advanced and fiscally responsible solutions. They desire transparent partners who will share information and technology and work side-by-side to deliver information and tools to their members. We feel pretty, well, “Validated and Honored” to be included in this group. The commitment to success and innovation is not simply what they are talking about, they are walking the walk. 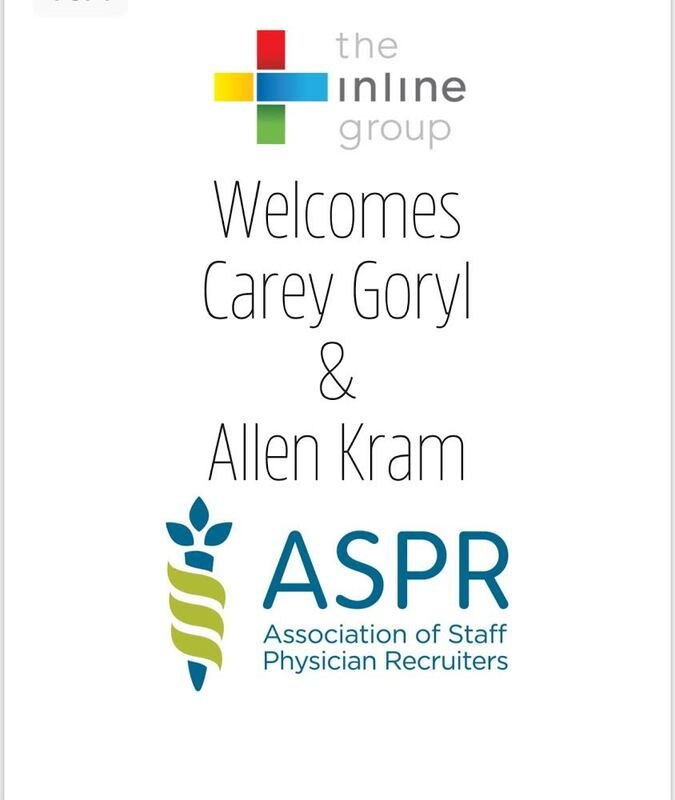 Carey Goryl, Executive Director, and Allen Kram, Vendor & Partner Relations Chair, took the time to come to our office to see our platform, process and to talk about partnership ideas. Clearly, The Inline Group has spent the last 10 years driving to automate and modernize the industry. It is very exciting to have an organization as respected as the ASPR recognizing the innovation and technology. Without the primary care physician (PCP), why discuss healthcare or the Affordable Care Act?Physicians are the foundation of healthcare. Without a physician, who feeds the hospital, the nurses, the pharmacy, the physical therapy tech, or the food services provider? Who feeds Medicare and Medicaid and private insurance companies? Physicians attend medical school and then choose a field for residency. Physicians cannot provide medical care to a patient without completing a US residency, regardless of where they attended medical school. The limited number of residency programs available restrict the number of candidates who can attend residency each year. Physicians interested in primary care medicine will typically complete a residency in family medicine, pediatrics, internal medicine, obstetrics and gynecology, and psychiatry (as mental healthcare is becoming intricately connected to many primary care conditions). A physician who completes one of these residencies can then deliver services considered primary care. A small piece of my soul dies when I hear these stories. Some of the most creative, intelligent, competent physicians I have met enjoy robust, fascinating practices in primary care. I am going to pick on orthopedics here, because I just spent a great deal of time with my orthopedic knee specialist. But, that is all he does…knee surgery over and over again. Middle aged people like me, arrive with knees damaged by age, weight, or inactivity, wanting the miracle of surgery. Don’t get me wrong, I like knowing that my knee will be replaced by a guy who does it all day long, but really….smarter? A primary care physician in Northern California performs chemo, genetics testing, wellness services, orthopedics, obstetrics, and inoculations. She then delivers babies and cares for mom and the baby throughout their lives. She serves as the primary provider in a community with no other medical care. With her network of specialists who provide support, she delivers care that requires problem solving, critical thinking, commitment, and compassion. When I compare her to my knee doctor, they are not even on the same planet. Sorry doc! We must find a way to ensure compensation that covers their skills. CMMS is working on new compensation models that could have an impact. However, even those options are at risk due to the political environment. Here I go with the politically incorrect rhetoric. Physicians commit to a rigorous education and training program. They forfeit sleep, family, income, and life as the rest of us know it to choose medicine. Failure can mean death. Needless to say, while trained in the scientific method, they do so with a healthy, real fear of failure. On top of this, they often depart their education with debt in excess of $200K. It should not go downhill from there. Choosing a career in primary care or even worse, primary care in an underserved area, their income barely covers malpractice and loan repayment. The MGMA, the nation’s premiere authority in physician salary, suggests a mean salary of over $250K, while many facilities have no hope of paying this rate. We, in fact, have community healthcare facilities who can only offer $120K. How will the people in that community ever hope of getting quality care? To initiate any change, physicians must stand up for themselves and refuse to work for what the government and the insurance companies will pay. They must demand the income they trained for and deserve. A PCP generates from $1.7 million to $2.3 million to a facility. Yet in many cases, these docs cannot live commiserate to the service they perform. It is Primary Care Week. We owe these providers our support. Demand that your elected officials stand up and support healthcare. Truly, these physicians choose primary care as a calling, not simply a profession. Thank God for these committed physicians. In a world where we align with our political parties and rarely hear a position that differs from the narrative of our party, we have to stop. We must look at real issues and find a way to common ground to save healthcare in America. The Inline Group, LLC, stands to support primary care and the committed physicians and individuals who commit their lives to delivering primary care to the United States. Our differences are driving us to distraction. Pick a television network, any network, and expect to hear why we cannot agree on anything. Our political affiliations result in conflict. The timing of our immigration to America divides us. (Because with the exception of Native Americans, we are all immigrants.) Whether we shoot guns or don’t divides us. The options for differences are endless. In reality, our similarities far outweigh our differences. Look down at your feet, consider your knees, work your way up and consider your whole host of internal organs. Consider your arms, and face, and top it all off with that brain in your head. Yep, we all have physical bodies that need maintenance and assistance. Our lungs get congested, our knees wear out, we need injections, and we break arms or toes. Maybe you get your healthcare at a community health center. Maybe you have a family medicine physician who has treated you for your entire life. Maybe you periodically run to the urgent care center and don’t even affiliate with any physician. Regardless of our differences, we all need primary care. This Primary Care Week, instead of an endless debate about the Affordable Care Act (ACA) and its future, we need to ask ourselves the real questions. · How do we encourage young doctors to choose primary care? · How do we change compensation to allow the primary care physician (PCP) to earn a salary commiserate to their rich and varied practices and skill sets? · How do we reduce the debt physicians incur to enter a profession that limits their earning ability? · Where do advanced practitioners fit into the delivery chain? · How do we deliver healthcare to the most underserved? · How do we improve our support of the primary care provider and the organizations that deliver this care? · How do we increase the number of residency slots available for candidates? · How do we ensure that community health care centers can continue to serve their communities? The Obama Administration did the ACA a huge disservice when they allowed the entire debate to revolve around the insurance mandate. The ACA was a comprehensive approach to the delivery of care to patients when and where they need it. Prior to ACA we had universal health care. It was called the emergency room. We can’t go back. Do many Americans know that the ACA significantly changed the way that care is delivered to the underserved? No! Do they know that CMMS and National Institutes of Health are piloting new ways to compensate physicians? No! Do they know that the community health care system delivers care to the underserved in a far more efficient and effective manner than ever before? No! Do they know about the growth in urgent care and its place in the delivery channel? No! Do they realize that technology allows for care to be delivered in places previously unserved? No! Tragically, the Centers for Medicare and Medicaid Services have already announced that they are cancelling three of the new reimbursement bundling programs intended to begin in 2018. Unfortunately, most of our opinions and knowledge are based on what political party we affiliate with and which agenda is driving the narrative. Political narrative appears to already be impacting good programs that would change the reimbursement models being tested. This Primary Care Week, regardless of your political affiliation demand that your elected officials address the real issues. We don’t have enough providers and we don’t compensate them appropriately. We lack residency program slots to educate physicians. We restrict the flow of foreign medical graduates which further limit care to the underserved. Primary care affects you. If you don’t think so, just wait until the next time you get the flu or your aging diabetic mom can’t get in to see a PCP because they don’t take Medicare. Or perhaps you will retire to a beautiful community in the mountains of Colorado only to find that no physicians are taking new patients with Medicare. We can focus on our similarities and make a real difference, but not unless we stand up to be heard. See Part II on the role of physicians in this issue. Why Do Those With Insurance Get to Decide Who Gets Care? For 51 years community health centers (CHC) have delivered care to the underserved and the job is not getting easier. Regardless of your political affiliation, you should celebrate the movement of routine medical care from our nation’s emergency rooms to community health centers. You can argue against a national health plan, but in reality, the use of emergency rooms for the delivery of primary care is a national health plan. Perhaps one of the most significant flaws of the Obama Administration was their national rhetoric. The Affordable Care Act (ACA) (Obamacare) did so much more than mandate insurance coverage. The ACA significantly expanded the CHC network and revenues. States with Medicaid expansion saw substantially more insured patients than those who opted not to expand Medicaid. In 2015, 1,375 health centers delivered care to 24.3 million people including 1 in 6 Medicaid patients. Yet, the debate about the future of Obamacare remains centered on mandated insurance. Additionally, the ACA set up a federal grant fund, that is essential to the existence of CHCs. In 2015, this trust fund provided 20% of the funding to these centers and allowed them to deliver care to those that are without any insurance or assistance. Congress, in an amazing bipartisan action, extended the ACA, health center trust fund until September 30, 2107. But, what happens then??? The discourse in America now about the future of the ACA fails to look beyond the surface to the progress made toward a more cost effective delivery of healthcare to the underserved. I meet and work for so many physicians and administrators who work exceptionally long hours, for very little pay, to ensure that our most underserved have a chance. There is no question that the delivery of routine care dramatically reduces the number of emergency room visits or length of hospital stays. The providers who work in what we call “mission-minded medicine” do so because of the size of their heart, not the size of their paycheck. They must not be left to soldier on alone. Luckily for most of you reading this, and certainly for our elected officials, we have insurance coverage. We don’t need to find our nearest community health center. I am not advocating for more assistance or for a national health plan, yet all we seem able to do is argue about our difference. We desperately need incentives to encourage physicians to work in our CHCs, because they certainly are not compensated adequately. We struggle to find doctors willing to work in rural or urban community centers because they are unable to pay their insurance and student debt. Because of the laws regarding federally underserved areas, we funnel our foreign trained physicians in need of a J1 Visa Waiver to these communities, but we offer no incentives for them to remain in these areas once their waiver obligation is met. Resulting in communities with no continuity of care and the added expense and disruption of hiring a new provider every three years. This year as we celebrate the 51 years of community medicine, stop and take a stand. Consider that the care must be delivered somewhere and someone must pay for it. Demand that your elected officials stop arguing about the inane and instead focus on: incentives for physicians to serve this community, incentives for physicians to choose primary care careers, and the extension and expansion of the funding needed to continue community medicine. Whatever your political affiliation, we all benefit from a strong community health center system. And many, many thanks to the men and woman who serve on the front lines. We all owe you a debt. As I have watched the crescendo of noise and news around the repeal and replace of ACA over the last weeks, I found myself hoping that the baby does not get thrown out with the bathwater. Last week, I found myself at my local urgent care/stand-alone ER. I can choose from three within a mile or two. I choose this center because it is a hybrid offering both urgent care and ER services and it is open 24 hours. I also like the young ER doc who is usually there. Like 70% of primary care practices, my PCP does not offer after hours care and currently it takes about five days to get a sick appointment in her practice. I have learned a lot about healthcare delivery from my doctor friend. He left his job at a large ER to participate in this experiment to offer urgent care and ER care in a single facility. He gets to control the balance of his life, spend one on one time with patients and take a stand in how he delivers medicine. Personally, this seems like a brilliant concept to me. Entering the facility as an urgent care patient and being treated as such, usually meets all our needs. On a couple of occasions, after some tests and a long discussion with the physician, a decision was made to move to ER services. This choice came with a clear discussion of the reason, signatures on multiple forms, explanation of the additional cost and an actual physical move to a different treatment room. Not only was this exceptionally convenient, but it allowed me to go home in much better condition than would have occurred without the ER option. Every employee in the facility is a part of a team and is willing to function in any necessary role and to do so with a great attitude and smile. Procedures are performed promptly and efficiently without hours spent waiting. Keeping the facility staffed is sometimes a juggling act and the physician in charge directs the patient flow. The tech who started my IV told me that the “acuity level” of care he delivers is not as high as it was at the hospital ER, but he likes the doctors, the patients and the way he is treated. The facility is always staffed with an ER doctor as well as a support team. Urgent care centers often allow physicians much more control over their schedule. Over and over candidates are making choices which allow them to retain control over their lives. In a survey in 2016, The Inline Group found that 44% of graduating residents list “quality of life” as their number one job factor. Of the primary care candidates surveyed, 70% list location as their first consideration when making a job change. The ACA has changed the delivery model of healthcare in America. Physicians have more choices today about where they want to practice and given the choice they continue to choose work-life balance. The exponential growth of urgent care centers and innovative options will continue to entice physicians interested in treating patients in more non-traditional settings. Chris Mathew, COO of The Inline Group, and I will be attending and speaking at the Urgent Care Association of America Urgent Care Convention and Expo later this year and learning even more about the trends taking place in urgent care. If you'd like to know more about what we're seeing in staffing urgent care centers, contact us and we'll be happy to share our data.